After five years with my older Main-Workstation it was time to upgrade, or better replace it for a new one. 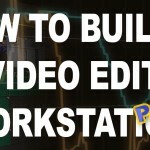 This is the story how I’ve choosen the my video editing workstation for the year 2016 and beyond, mainly to achieve 4K realtime editing in Premiere Pro CC 2015. While I do not want to wait too long to get all the neccessary hardware components, I did a slow start building the new workstation by upgrading the old one with a new CPU. Although the Asus Crosshair IV Formula mainboard is already on it’s limits, I found out that I still can upgrade it’s cpu to at least a AMD FX-8150 (supported by Asus) or even the FX-8370. As a first “test” I upgraded the mainboard bios to the beta version v3027 which officially supports the FX-8150 CPU. So far so good. As a pre-test with the older workstation I ran a few benchmarks, in particular how playback is running in Premiere CC. The current version of Premiere CC is 2015.2, but I cannot use it, because the corresponding Speedgrade 2015.1 still has some bugs. It just shows most clips as offline. So I currently have to go back to version 2015.0.2 for Premiere CC and last Speedgrade version 2015.0.1 that is running on my current (old 2012) setup. 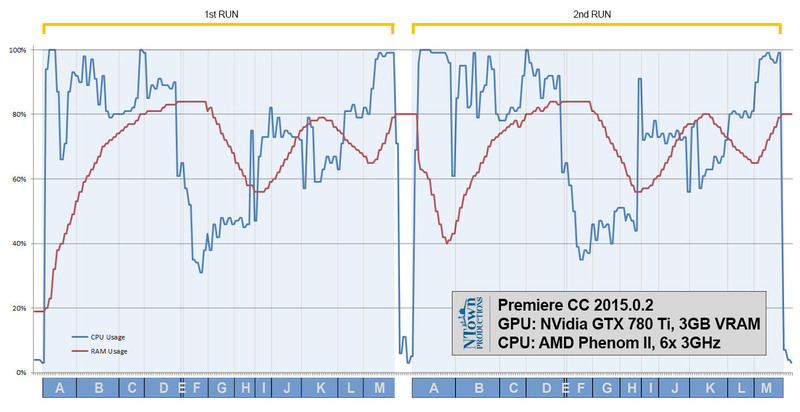 Adobe was aware of a AMD Phenom II bug in Premiere CC 2015.1 and fixed it for PrCC 2015.2, but unfortunately they left out Speedgrade to fix another bug (presumably still an AMD Phenom bug) which causes the problem with offline clips in Speedgrade. So I started up Premiere CC version 2015.0.2 and threw in some 4K clips on the timeline. The footage contains some of the new Canon C300 Mark II, Canon 1DC, Canon XC10, Red ScarletX, Blackmagic Cinema 4K, Sony F55 and some recorded as ProRes 4K and DNxHR 4K with a Atomos Shogun. Below is the playback performance of the timeline for these clips, all played in full resolution after a fresh reboot. Look for the letters in the charts to find the corresponding camera footage. 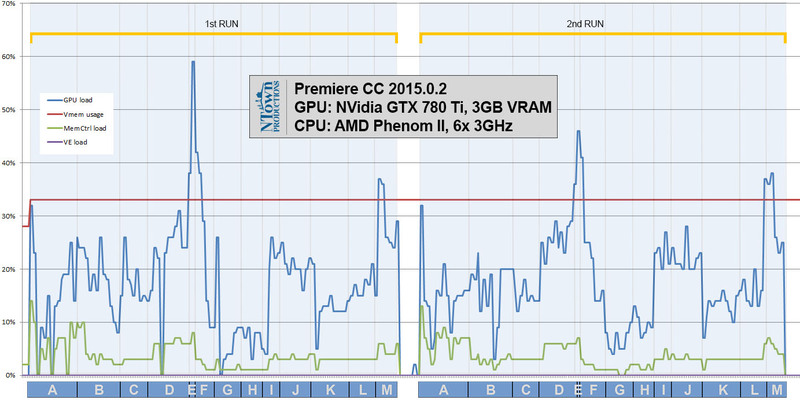 CPU load is high with 4k footage. 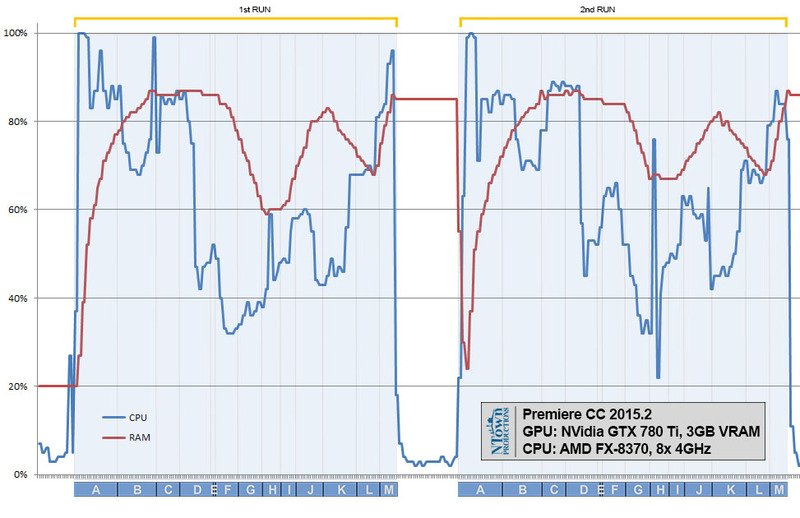 Notice the lower GPU load on second playback. With the AMD Phenom II, the 4K playback was mostly choppy, with half of the 4K clips playing in realtime. There were about 1052 dropframes on the whole sequence. 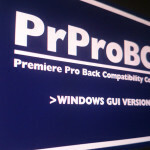 The second playback had about 990 dropframes. 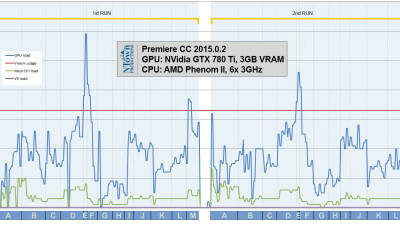 RAM is crucial for 4K editing, as the graph shows, it is eaten up completely. What we’ve learned? 4K editing needs more than 32GB RAM, better start with 64GB or add more to be save. The Nvidia GTX 780 Ti GPU seems to have enough headroom for 4K playback with only a short peek while playing Canon 1DC clip . After I successfully updated the mainboard firmware of the Asus Crosshair IV Formula, I bought an AMD FX-8370 8-core cpu which should boost my performance a bit before I start building the new workstation. Surprise (actually I already suspected this): All of the bugs with my Phenom II 1100T cpu are now gone after upgrading just the cpu to the FX-8370! Every hardware component in the old workstation remained the same, I just swapped out the cpu. 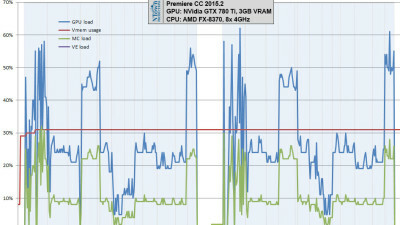 So there are definitive bugs in Premiere Pro CC 2015.2 with Avid’s DNxHR 4K codec in association with the AMD Phenom II and also in Speedgrade CC 2015 2015.1, where nearly all movie formats I tested were shown offline in Speedgrade and when saved and returned to Premiere, the clips where still offline and they needed to be relinked to be online again. I even filed a bug to Adobe about this back in february 2016, but Adobe did not react nor did they released a fix to that particular problem. 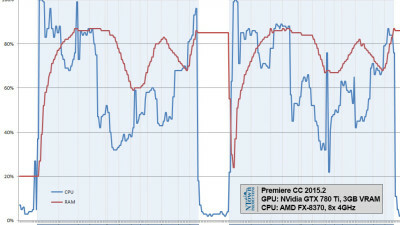 After just exchanging the cpu from the AMD Phenom II to the AMD FX, the bug is gone – what more proof do they need? Other than that, Adobe did a really great job on their products and I understand that they are focused on the most used hardware around, which are undeniably Intel CPUs and not the AMD ones. I did a few performance checks and everything is running fine, about 30% faster than the AMD Phenom II 1100T. Below is a chart showing a Premiere Timeline playing back a 4K sequence with 13 different clips from several cameras like Red, Canon, Sony, Blackmagic and after playing the sequence wrote down the dropped frames in Premiere. It is still not perfect playback for 4K, because there are still drop-frames and the 32GB RAM is eaten away pretty fast. Checking the drop-frame indicator in Premiere CC shows about 700 drop-frames playing the same sequence and on second play there were 550 drop-frames because many frames are cached in ram. Playback feels a lot more fluid with the FX-8370 and most 4K clips are played without dropframes, like the Canon C300 MkII XF-AVC codec and the Sony F55 X-AFVC codec among others but RedCode 4K is still not realtime and playback resolution needs to be 1/2 to play without drop-frames. Most drop-frames came again from the Red-Code movie (clip A), the other clips alltogether had apx. 60 drop-frames. 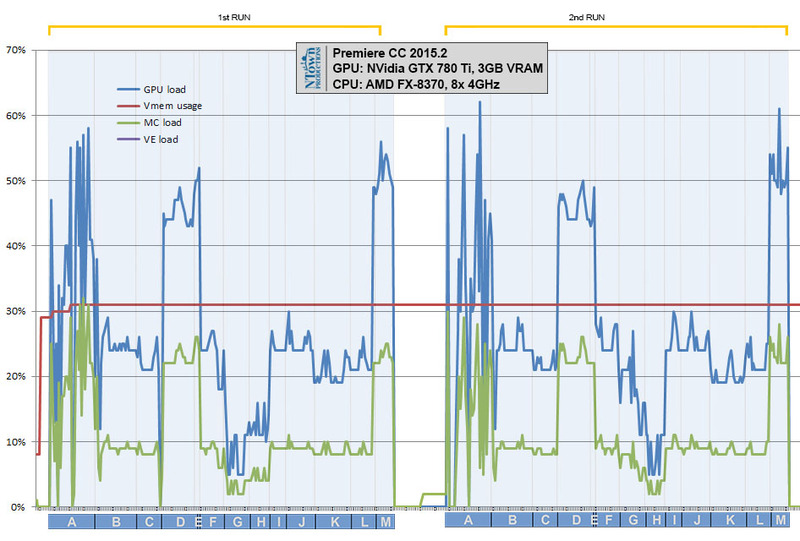 In this run I used Premiere CC 2015.2 (the newest version from 2016-03-15) and the interesting thing is that there is more GPU usage than with Premiere CC 2015.0.2, so it seem the newer Premiere utilizes more GPU power, which is a good thing, because it reduces load from the CPU. 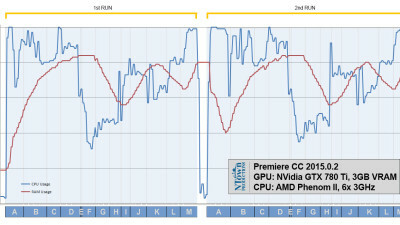 The last chart is a Harddisk performance check. 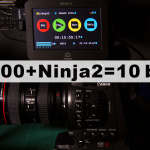 How much HDD speed does 4K material really need? A lot you might think. Think twice. 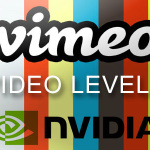 As always it depends on the type of footage, 4k is not 4k. Harddisk performance of different 4k movie file formats. The chart above shows a maximum harddisk transfer speed of 98.87 Megabyte/s, which is 785 Megabit/s and only jumps up to it’s maximum while playing Sony F55 footage. 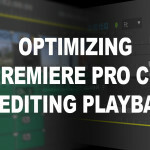 Premiere pre-loads a few seconds from the next movie clip in the timeline and then displays it at playback, therefore you see a delayed loading curve at the chart which shows the different harddisk transfer speed needs of the different movie formats. 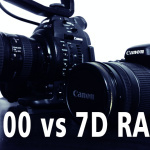 The lowest transfer speeds, unsuprisingly are needed for the movies with low bitrates like the GH4. 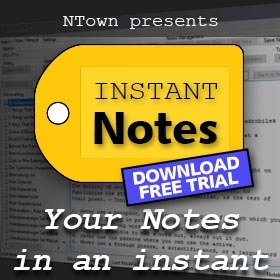 It’s a good upgrade, alltough a minor one compared to the new main-editing-workstation that is coming up to NTown! Stay tuned and subscribe the get informed when the next part of the article is finished, when the components for the new 2016 workstation are arriving and the new beast is beeing assambled. To make waiting shorter, jump over to my current workstation and watch the assembly video there.